We are always happy to talk with you and get to know your business needs. You can start by getting to know us. Here’s a little about each member of the Roanoke Regional Partnership staff — five questions, each answered in their own words. Beth Doughty has twice been executive director of the Roanoke Regional Partnership from 1991 to 1999 and since March 2008. She also serves as executive of the Roanoke Outside Foundation and executive director of the Western Virginia Regional Industrial Facility Authority. 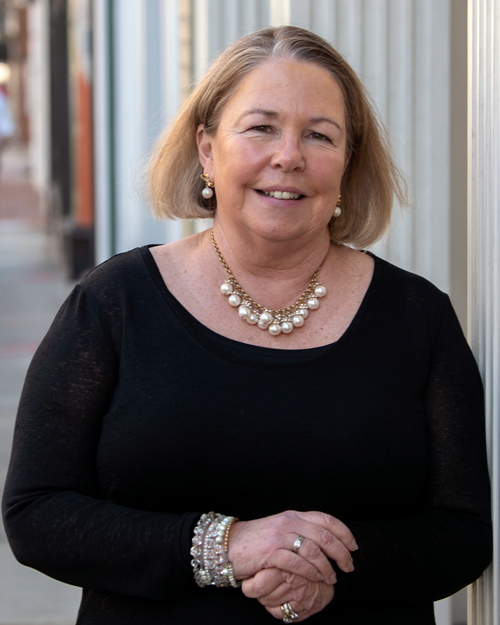 After a start in advertising, she has spent more than 25 years in economic development, helping to create more than 14,000 jobs and $1 billion of investment for the Roanoke Region of Virginia. I enjoy figuring out the motivators for people’s actions and decisions and then coming up with strategies to address them. It’s like solving a puzzle. I’m working on a list of the 100 songs I’d put on my playlist if those were the only songs I could listen to for the rest of my life. So there’s a lot on my playlist right now as I’m working through the history of rock and roll and trying not to forget anything. The Underground Culinary Tour: How the New Metrics of Today’s Restaurants are Transforming How America Eats by Damian Mogavero and Joseph D’Agnese. Big data fascinates me so I’m trying to figure out how behavioral metrics could build economic development strategy. Where’s your favorite place to play in the Roanoke Region? The Roanoke River Greenway is convenient for me, my friends, and my pugs. And it offers great flexibility to walk, run, or bike for as much or as little as the schedule allows. Lisa Lyle directs the business attraction and expansion program of the Partnership. I love the diversity of the companies and projects that I work with. Lately, it would be Shape of You by Ed Sheeran. But overall it would be Soulshine (live) by Warren Haynes. I’d like to have endless energy. My favorite place for fun is downtown Roanoke. I love the energy, arts and culture, and music. I also enjoy the abundance of greenways in the region. John Hull is the Roanoke Regional Partnership’s data guru. He has more than 10 years of experience producing data analysis for regional development and strategic planning. He handles a variety of data requests from the public and prospective businesses. I really enjoy connecting both businesses as well as individuals with information. When people contact me, it is because they need a demographic report, a statistic, etc., and oftentimes they do not really have a handle on what it is they need. I can put form to their request and fulfill it. I see it as a valuable service to the community and the region. And sometimes, the work supports a company’s decision to locate in the Roanoke Region or an entrepreneur’s decision to start a business, and that is a very rewarding feeling. “Still of the Night” by Whitesnake. Because, Whitesnake … Van Halen’s Live: Right Here, Right Now album fuels my morning run. Either super speed or flight. Can you imagine? No need for any transportation expense. I recently finished Fight Club by Chuck Palahniuk and I just started Matt Bondurant’s The Wettest County in the World, which is about a family who made moonshine in Franklin County during the Prohibition era. I like playing on my Hustler zero turn mower in my yard. Running through the country roads of Franklin County is also enjoyable. I love how quickly our community embraced our regional effort to become a true outdoor community and I’m impressed with how both our public and private businesses partners recognize that trails, rivers, mountains, and lakes are more than just dirt and water – they’re economic and talent generators. Within a few years our community narrative has shifted to one that places a high value on quality of life with an emphasis on outdoor recreation and environmental stewardship. I truly enjoying being part of the positive transformation that is taking place throughout our entire region … it’s pretty awesome. Most people don’t know this about me, but I’m a huge disco fan. That’s doesn’t mean I can dance disco, but I love funk and soul music. Disco Inferno by The Trammps probably gets the most airtime. Easy … the power to read minds. Think about it, just in the economic development realm it would be a game changer for projects. I’m a huge fan of Malcom Gladwell. I just finished Outliers which examines how a person’s environment affects his or her possibility and opportunity for success. Next up … What the Dog Saw, also by Gladwell. It’s not so much my favorite place, but rather my favorite way to experience your own backyard (not literally your backyard, but rather your own town). Just hop on a bicycle with no planned route and just go wherever you feel like going. Exploring at a slower pace opens your eyes to things you don’t normally see. Lisa Link ensures that everything comes off without a hitch. She handles the details . . . coordinating investor meetings, prospect visits, accounting, and keeping the office running smoothly. Lisa joined the Partnership in 2010, after 13 years at the Roanoke Regional Chamber as vice president of membership and member services. Working with a team that loves our area and works to grow the area. I actually listen to music all day long. It’s the soothing background noise that helps me move through the day (even if I’m not always listening). This was a tough one, but Ed Sheeran’s Thinking Out Loud always seems to catch my attention. It would be great to have the ability to be in two places at the same time. Night by Elie Weisel. Wiesel won a Nobel Peace Prize in 1986 and this book is his memoir that details his guilt and feelings with surviving the Holocaust. It’s heavy, but important reading. The Blue Ridge Parkway remains one of my favorite spots years after coming to the region. Growing up in California, nature isn’t as colorful as it is here. From the greens of trees to the actual blue in the Blue Ridge Mountains, I continue to be in awe of nature’s beauty. Carrie Cousins develops content and marketing materials for the Roanoke Regional Partnership. She is a designer, writer, and content marketer with more than 15 years of experience in the media industry. She’s also the voice of the Partnership online and on social media through channels such as Roanoke_Region and Get2KnowNoke. Desperation Song by Carbon Leaf. The aggressive beat just makes you want to sing along and stomp your feet. The Virginia-based band has been one of my favorites for ages. Is having a clone considered a super-power? I love our trails and the greenway system. I do a lot of running and mix up dirt and paved trails. There’s a shorter section of greenway in Salem (starting at Rotary Park) that I run regularly; year round there’s nothing like the breeze coming off the river. Some days the run is quiet and peaceful, just me and the dog in the pre-dawn hours, but other times the path is bustling with people of all ages — walking, running, biking, swimming, paddling, coming into the ball park – and it shows you what a community that loves the outdoors looks like. Julia Boas manages events for Roanoke Outside, the Roanoke Regional Partnership’s outdoor brand development branch. She has worked in the outdoor industry for almost a decade with experience guiding adventure excursions, planning outdoor related events, promoting, management, and customer service and is the driving planner behind events such as the Blue Ridge Marathon, Radical Reels Film Festival, and the Roanoke GO Outside Festival. I love collaborating with all the different organizations and businesses in our region. There are so many amazing people that live and work here and they genuinely want to see the place they live continue to get better and more fun! From my experience, it’s rare to find a community where so many are eager to give back and make an effort to leave something better than they found it. Brainstorming with them about unique events, creative ways to promote the region, and the future is so exciting. An added bonus is getting to see the effort we make turn into real change. This is a tricky one. I mostly listen to NPR and Podcasts. But when I’m at home listening to the record player some of my favorites are Lauryn Hill, Beastie Boys, and Mumford & Sons. I like variety! I’ve always flip flopped on this one. One I made up is being able to close your eyes and think of a place and then open them and you’re there. The other I’ve always thought would be cool is to be a shape shifter like Mystique from X-Men. I just finished The Goldfinch by Donna Tartt. It was about a boy dealing with the untimely death of his mother and then it sort of worked its way into being about black market art, drugs, and the Russian mafia. It’s a complex book (and 800 pages) but really good if you’re okay with dark topics. I generally love any historical fiction. Erin Burcham is developing a strategy to recruit and retain talent for the Roanoke Region’s economy. She is a graduate of Leadership Roanoke Valley and serves on the Leadership Roanoke Valley Alumni Association steering committee. She is a board member of Junior Achievement, past chair of eXperience, and serves on multiple regional committees. Although I love many genres of music, my go to is country. My two favorite country songs right now are Old Dominion – No Such Thing as a Broken Heart (two band members are both originally from the Roanoke Region and played drums for their high schools, James River High School and Lord Botetourt High School) and Eric Church – Carolina. Precognition – the ability to predict the future. I enjoy ideating but love to see ideas come into fruition. If I could predict the future, it would help to know where to spend more time. I just started The Power of Moments: Why Certain Experiences Have Extraordinary Impact by Dan and Chip Heath. This book explores why certain experiences can excite us, elevate us and change us. Our favorite family hike is Bottom Creek Gorge. This is a beautiful hike that our 4-year-old daughter can do with us.